In Nkisi Nursery School, life skills are developed and a foundation laid for the future years of study. Much pre-reading work is done, and majority of the children are reading with confidence by the time they leave the nursery level. Children are assessed at the beginning to determine their levels of development and co-ordination by means of games, stories and eye-to-hand control exercises. By the end of nursery two, children are able to name and distinguish all the colours; use prepositions, express their feelings and follow instructions. They are able to dress themselves, distinguish between left and right and recall stories and songs. They are familiar with numbers up to 10 and are able to play simple number games, the words "take away" and "add" having been introduced. 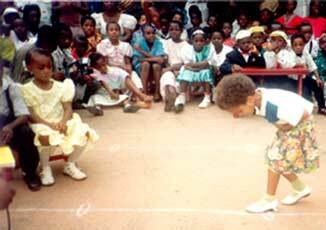 They begin to learn French by means of simple games and songs. At this stage the children can be given certain responsibilities. Nursery 3A can read short stories by sound reading. They can spell, subtract and add with carrying. They know times tables one to five and can do mental mathematics.